Dr McAviney is the clinical director of Sydney Scoliosis Clinic, and one of Australia’s leading authorities on non-surgical scoliosis treatment. He holds Masters degrees in Pain Medicine and Chiropractic, and brings a wealth of experience in scoliosis treatment, education, and research. Dr McAviney oversees all cases and gives guidance to the clinical team. He drives research development initiatives to ensure patients get access to the latest and most evidence based procedures. Originally from South Africa, with a Masters in Technology of Chiropractic, Dr Du Plessis has been a clinic director in prestigious healthcare centres in Asia, providing scoliosis rehabilitation and bracing. He has received advanced training and certification in SpineCor and ScoliBrace bracing protocols and has completed SEAS (Scientific Exercise Approach to Scoliosis) training and accreditation. Dr Brown is a trained and registered Chiropractor with a special interest in non-surgical management of scoliosis. He holds a Bachelor of Chiropractic Science, a Master of Chiropractic and completed his PhD in 2012. Dr Brown is an experienced clinician, having been in private practice since 2003, and has extensive experience in helping and supporting patients as they move through their treatment journey. He has received advanced training and certification in ScoliBrace bracing protocols, and is Schroth and SEAS (Scientific Exercise Approach to Scoliosis) trained. Rebecca has many years’ experience in Exercise Physiology. She has worked with patients of all ages in various health care settings. She has also undertaken training in scoliosis and scoliosis specific exercise to ensure all patients have the most suitable evidence based rehabilitation program for them. 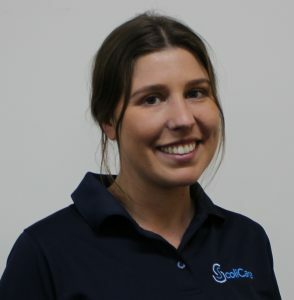 Rebecca has a supportive approach to encourage all patients to achieve the best outcome in treating their Scoliosis, and holds a Bachelor of Applied Science (Exercise Physiology) Degree. Our Patient Liaison and Clinic Receptionist Carol has over forty years of experience in administrative and customer service roles. Carol has a genuine personal interest in Scoliosis as she was diagnosed with the condition in her younger years. She underwent quite extensive scoliosis surgery and can relate first hand to patients’ experiences growing up with scoliosis and their queries about treatment. Carol is happy to answer any questions from parents and makes all feel welcome and well looked after. Erin brings her supportive nature and efficient manner to the Sydney Clinic reception. She has worked with patients and customers in various health related and educational positions in recent years. Erin is always happy to assist all our patients and their families throughout their treatment journey.